My colleague Mike Brough and I have been involved in the redesign or relaunch of more than 90 newspaper and magazine titles over the last 24 years. It all started back in 1990 when we redesigned the paper we were working for, The Northern Echo, taking it into full colour and winning three categories in the Newspaper Industry Awards. 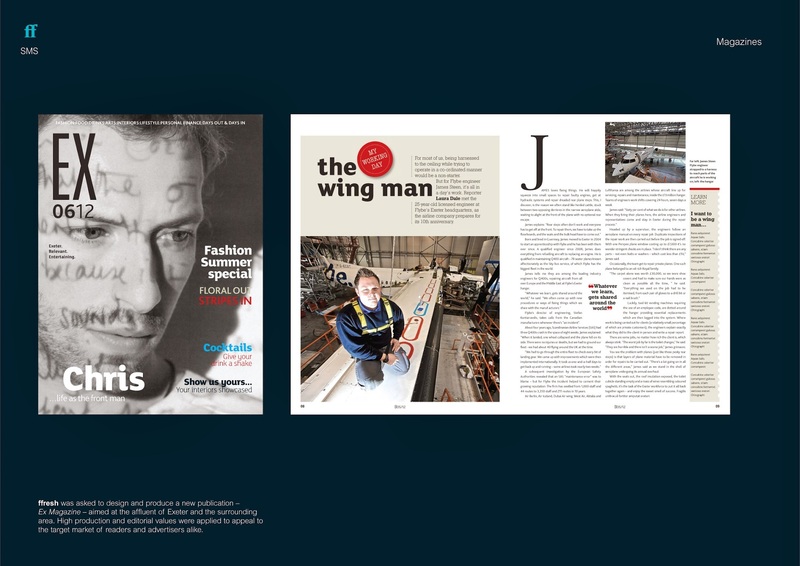 Five years later when we set up our independent companies, the Editorial Centre and Fusion, we offered redesigns as part of our services. 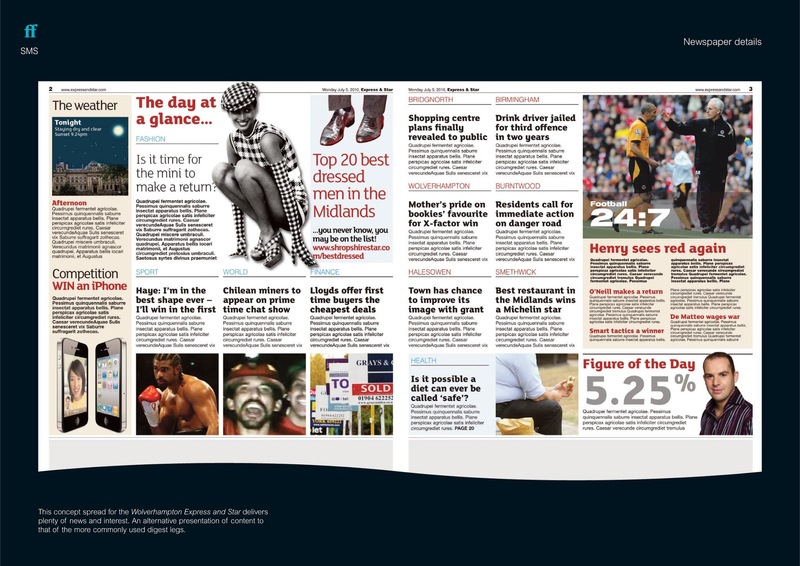 Our first redesigns were the Daily Echo in Bournemouth and the Sunday Mercury in Birmingham. It was then that I quickly learned that I was no longer the editor … that I did not have the final say. It is the editor and the community that dictates what the paper looks like, not two designers working from their studios in Sussex and Durham. There have been times when we have given newspapers a design that we didn’t particularly like. It doesn’t matter. What is crucial is that the readership and potential readership find it appealing. On one famous occasion we were even told by an international paper’s editor to ‘make the design duller’. Highlights over the years have included launching the Sentinel Sunday in Staffordshire with 21 days' notice; turning the Irish News into a Berliner and then a compact; changing the Guernsey Press into a compact amid some considerable resistance and transforming the evening titles in Bath and Torquay into weeklies. 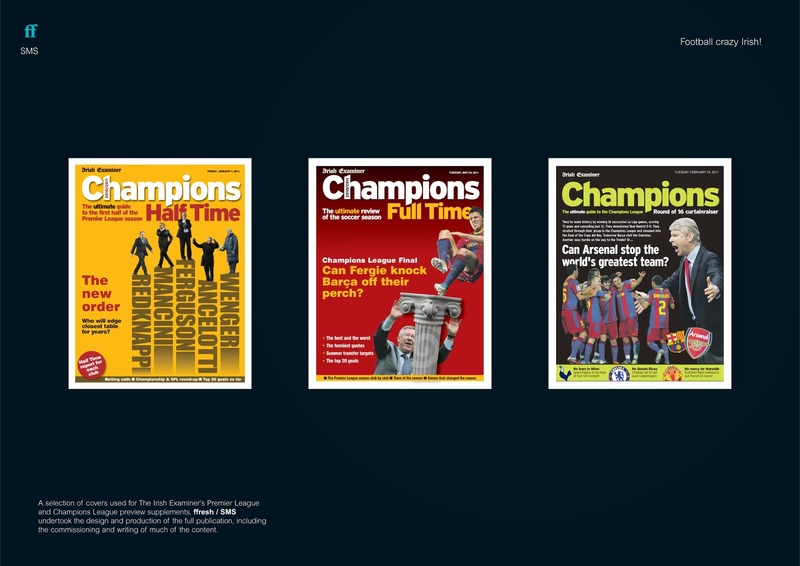 One of my favourite jobs, was to design the football magazines for the Irish Examiner. For five years we produced them live - 64 camera ready pages - and sourced and wrote much of the content too. I would always write the Newcastle United analysis ... a real labour of love. There are different ways of redesigning a title. Sometimes we work remotely and present completed pages to the editor, other times we sit alongside the newspaper’s production team, watch the changes evolve and help them build the templates. The late editor of the Sunderland Echo, Ian Holland, once hired a room in a hotel in York and we kitted it out with Macs and printers. Everyone joined in - the sports desk, newsdesk, features, and commercial departments all turning up at different times to create pages in the new designs. We worked around the clock with a constant room service flow of coffee and pizzas. By Friday night a full redesign was on the hotel's walls. Whichever approach we take, it all starts with the key question. What are you seeking to achieve? The main answer used to be to bring in new readers, perhaps younger people or a different socio-economic group, or to expand geographically. Everyone was looking to fill gaps in the market. Sometimes it was to fend off an aggressive competitor, launch a new section with commercial potential or, worryingly, just because the editor fancied a change. Nowadays a redesign is often to stop existing readers from leaving ... to try to stem the circulation decline. Of course a new-look in itself won’t do that. So redesigns go hand in hand with a full content review, research, marketing and a detailed examination of the difference and similarities between the print, online and tablet offerings. Mike and I now have new companies, Sands Media Services and ffresh creative, and our redesign work shows no sign of diminishing. I guess publishers know all too well that one thing is certain. Interest in their print titles will continue to fall if they simply offer readers more of the same. We have now produced a brochure showing some of our work and how we can help. If you would like it sending as a PDF drop me an email on petersandssms@gmail.com and I will send you a copy. In the meantime, below, are a few different approaches that you might be interested in. - a session with the editor looking at strength, weaknesses and the key areas to be addressed. - discussion with senior management on the changes required and how they can be achieved. - a timetable drawn up for the changes. - training sessions with all journalists. This looks at what they deliver now and how it could be improved. 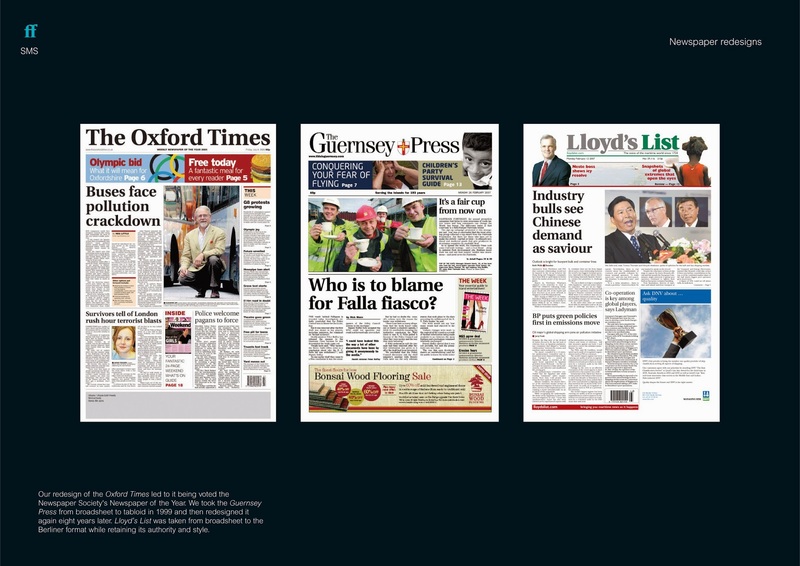 There is also a look at reasons that people buy newspapers … and how many of these are included in the titles. Writing style, length, use of language, topics covered etc are also examined. - sessions with the subs/layout people on ways to improve the look of the paper. Once the necessary changes are identified we work with you on drawing up a strategy, restructuring the newsroom and whatever else is required. We can do this by coming into the offices or helping remotely through reports and phone conversations. You can, of course, carry this out independently following the pointers from the first session. - We pick the brains of the senior executives on content and design issues; we examine any research, demographic information, strategy and analyse the responses to a series of redesign questions. These questions are sent as a Word document for completion by the senior management team. - We draw up a series of visuals for all pages of the publication. There is a range of visuals ie several fronts; different inside/advertising styles etc. These are boarded up and a presentation is made to the management team and, if required, the staff. This is followed by a discussion to ascertain any changes. - You retain the visuals and advise us on those elements you prefer and would like to develop. We carry out amendments and send pages as PDFs. This process continues until you are 100 per cent happy with the outcome. - Once you are satisfied with the new-look, the pages are presented to you on disk. We would then come to your offices for two days to template the pages on to your system, train your layout subs in the new design and provide you with style guidelines. - In addition you might also want us to produce a dummy to be printed, organise and carry out your research, carry out the marketing (both internally and externally) for the changes and provide a timetable for change. We can also look after the editing, design, printing and distribution of the titles. Instead of us redesigning the publication, we become the catalyst that allows your key people to redesign the title. This is a three-day course in which we look at how to refresh a publication. We can deliver this at your offices. This is a very good course ... but it only takes you part of the way there. It depends on you having the skilled people to take the ideas from the course and convert them into a new-look. Some titles and groups have chosen this option. You hire one of our designers for a week to work with your key people and produce a series of visuals. The beauty of this approach is that the people on the title declare ownership of the design right at the beginning. The people you send need to be competent on the system, have layout experience and be prepared to work late into the evening. At the end the pages are presented in hard copy form, on disk, as PDFs and style guidelines are provided. You can run this in your offices or we can hold it at one of our design studios. If you just require advice and pointers without the training or redesigned pages, a good starting point would be to have a report prepared on the strengths and weaknesses of the title. This is a very detailed report that looks at all aspects of the publication’s content and design and makes recommendations as to what needs to be done. We would need six recent copies of the title plus any other relevant information (research, demographics, strategy, answers to the redesign questions etc). A dozen journalists from the Times and Sunday Times of Malta are sitting their law and politics exam today after a journalism exam yesterday. At the same time their portfolios and project on how technology has impacted on the Malta media are being assessed. It has been an 18-month project by Allied Newspapers, supported by Press Association Training. Here's hoping they all pass. Just signed off a 24-page curtainraiser for the Champions League to be published in the Irish Examiner on Tuesday. The Examiner makes a massive commitment to sport - publishing regular Premiership and European football supplements. We look after the layout and sometimes write for them too. 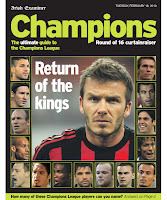 This issue looks at Beckham's return to Old Trafford and has a detailed analysis of all 16 clubs in the knockout stages. Quality stuff by writers Alex Diaz, Adrian Clarke, David Shonfield, Allan Prosser, Ben Lyttleton, Iain Macintosh and Iain Spragg. Clarke, a former Arsenal player, takes a detailed look at Beckham's career but in one piece recalls: “I first came across David Beckham on an East End parks pitch during a cup tie at the age of 13. I’d heard about Ridgeway Rovers’ skilful little number seven but I didn’t know much else. My team got the better of his that morning but by the final whistle, I could see why people had been talking so excitedly about him. Despite his size, he’d been outstanding." Nice touch.